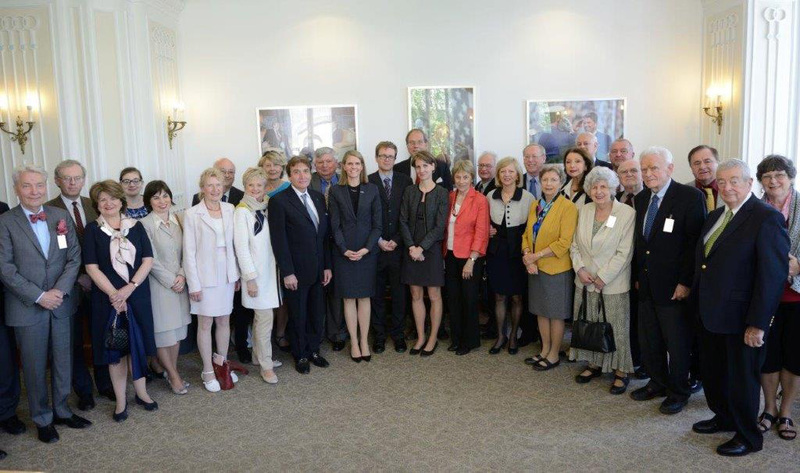 5/6/2016 -- AHF attends Friends of Hungary Conference, attends meeting with US Amb. Colleen Bell and submits letter: The Friends of Hungary Foundation held its third conference in Budapest on May 6 -8. Frank Koszorus, Jr., President of the American Hungarian Federation, attended the event along with Federation members and officers, Andras Ludanyi, Gyula Balogh, Zsuzsa Dreisziger, and Katalin Kadar Lynn. 1) considering that public criticism of Hungary tends to be counter-productive as it alienates the man on the street and undermines US strategic interest in Hungary, what other means can the US use to promote mutually beneficial goals, such as strengthening democracy and democratic institutions? 3) What progress has been made by Hungary relative to the military reforms that were raised when Mr. Koszorus was part of a fact-finding trip to NATO headquarters, Hungary, Poland and the Czech Republic sponsored by the US Departments of Defense and State to determine the readiness of the three aspirant NATO members to join the alliance? Following the productive meeting at which the foregoing and other issues were openly and candidly discussed, the Federation sent a letter to Ambassador Bell seen below or for [download]. While I am only authorized to speak on behalf of the American Hungarian Federation, I am confident the other participants at the Friends of Hungary Foundation’s conference share my appreciation for your taking time from your busy schedule to meet with us last Monday to discuss the status of U.S./Hungarian relations. We fully recognize that maintaining and strengthening good bi-lateral relations is not exclusively a function of U.S. policies but is a two-way street that must be vigorously pursued by both countries. As Americans, however, we have understandably focused on our government's policies toward Hungary. We especially appreciate your professionalism and integrity in addressing that relationship as well as your willingness to engage in a candid dialogue about how best to promote mutual U.S./Hungarian strategic interests and democratic reforms and institutions. Thank you again for meeting with us and considering our views, which we offer in a spirit of respect and constructive dialogue. We look forward to continue working with you in the interest of strengthening U.S./Hungarian relations and the foundations of those relations.